According with US Environmental Protective Agency (EPA), vessels grater than 300 GT or which hold the capacity to discharge more that 8 cubic meters of ballast water need to have Vessels General Permit (VGP) that regulates any of the 26 discharges listed below within 3 nautical miles from shore. Altho the requirement was first introduced on 19 December 2008 until now there has not been any reports, to our knowledge, that US authorities has requested relevant documentation to be presented by vessels in US waters. Inspections are expected to commence in the close future after cost guard personnel has been trained accordingly. We strongly recommend owners / managers to develop procedures, if not already done so, according with VGP requirements to avoid any problems in the future. For your easy reference you can download the VGP requirement. If requested, ANCO Maritime Activities Ltd can assist your company in the development of VGP manual. Types of incidental discharges according with USA Environmental Protective Agency that a Vessels General Permit need to be issued. Except that Graywater from commercial vessels operating in the Great Lakes within the meaning of CWA section 312 is excluded from the requirement to obtain an NPDES permit (see CWA section 502(6)), and thus is not within the scope of this permit. We recommend companies to prepare a VGP manuals that will include, procedures, check list, training procedures and inspection routines covering incidental discharges of the above 26 discharges. Discharges not applicable (such as sonar dome discharge) no need to be included. Above procedures could be included in the SMS manual, but it is not recommended, if vessels are not calling US regularly since the procedure will have to be followed world wide. Furthermore some of the above discharges (ballast water, MARPOL oil discharges) are already covered by international requirements. - First inform crew members that nothing from the above 26 discharges to be sent overboard wile vessel in US territorial waters. - Review the above list of 26 discharges and create procedures in order to comply with VGP requirement. For your easy reference we have included a table with what has to be done in each of the 26 discharges according with requirement. -Ensure that Toxic and Hazardous materials are safely stowed and protected from accidental emission to the environment. -Complete dry docking checklist that include inspections application of TBT free antifouling, descaling of sacrifice anodes, removing mud from chain lockers. A check list has been developed by BV and you can download from our site. -Observe overboard discharges on regular bases according with the procedures implemented by the company. Keep vessels decks clean from materials (loos rust, paint flacks, rags, oils, etc) that can be washed down to the sea. - Correct any stern tube or rudder bearings leaks, if any. To obtain VGP permit coverage, the vessel owner/operator would be required to submit a Notice of Intent ("NOI") to be covered. Below we have posted the time table according with the VGP requirement that NOI have to submitted. 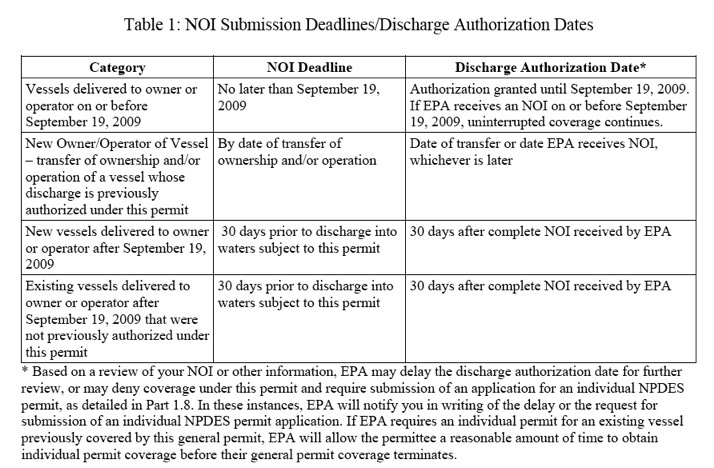 Vessels delivered after 19 September 2009 will receive permit coverage 30 days after EPA receives the NOI. An electronic application can be submitted from the following link. In the electronic version first you have to register by creating an account in CDX Central Data Exchange (set up a username and password) and then you can submit an NOI. Alternatively NOI can be submitted in paper and can be downloaded from our site with instructions. If you have any news or info you want to share feel free comment below. If you liked the above article click in the Google adds on the top right of this page to support our effort.